San Diego County on Wednesday released two proposals to establish a supervisorial district where the majority of the population is made up of ethnic minorities, a month after abandoning its original plans amid legal threats from civil rights attorneys. The county’s two alternative maps, scheduled for consideration by the Board of Supervisors on Tuesday, [Sept 6th] would create a South Bay district where Latinos and African Americans constitute a majority of the voting-age population. 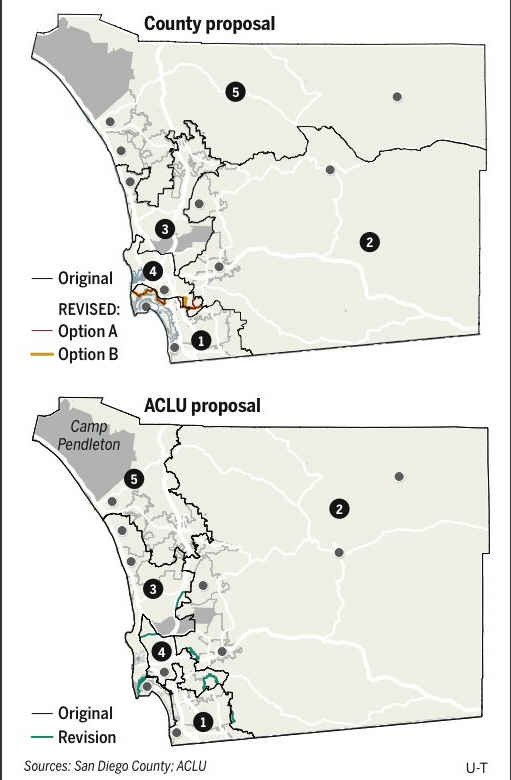 The decision to possibly give minority voters a stronger voice in upcoming elections came after the American Civil Liberties Union of San Diego and Imperial Counties objected to the initial map. Our earlier posts on this. Newer Article: Is former principal of Point Loma charter school being hounded by U-T Watchdog?